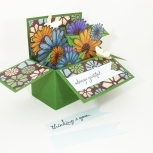 This butterfly encouragement card will provide encouragement and cheer to its recipient. 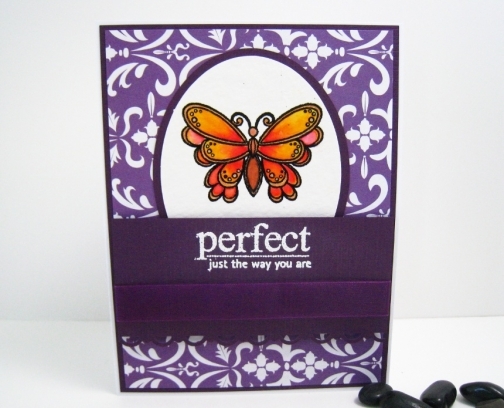 The butterfly is watercoloured by me and the sentiment, "Perfect just the way you are" is embossed in white ink for a raised and glossy finish. The bright boldness of the yellows, oranges and reds in the butterfly compliments the elegant purple background. 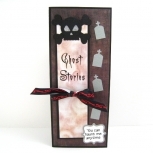 A sheer purple ribbon runs under the sentiment for added texture. However, Fairy Cardmaker, a division of Ensorcelled Minds Inc., is *not* responsible for any self-assesment provincial taxes or duties and/or customs levies that your location requires. It is the buyer’s responsibility to know when and how to self-assess and report, where applicable. What a lovely card! The butterfly is such a pretty colour.